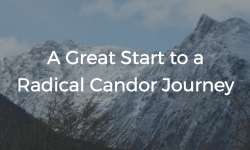 Discussing Radical Candor as a team can help solidify the ideas and get everyone thinking about how to start applying them to your day-to-day behaviors. We’ve put together this list of questions to get you started with the discussions for each chapter, but we’d love to hear your ideas as well! Let us know what drives the conversation for you in the comments below. Describe an experience when you didn’t give direct feedback, but you wish you did. Who are the best leaders you’ve worked for in your career? What made them so exceptional? What can you learn? Tell a story about the worst boss you ever had. What did they do that made them so bad? How can you avoid those mistakes? What does the book say are the key responsibilities of a boss? Many people mistakenly call Radical Candor the same as brutal honesty. 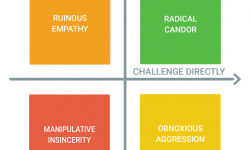 What is the difference between Radical Candor and brutal honesty? What are some ways that you show you Care Personally at work? Do you think Challenging Directly is a strength or a weakness for you? Describe an experience when you received feedback that you appreciated and that was delivered in a helpful and caring way. Describe an experience when you received feedback in a way that you didn’t learn from because you resented the way it was delivered to you. Have you ever been so nice that it ended up working against you? Have you ever felt there was no way to not be mean if you needed to get your desired outcome? Have you ever underestimated an employee’s contributions because they weren’t gunning for a promotion? What happened? Did you regret it? 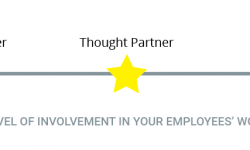 Have you ever clipped the wings of an employee on a steep growth trajectory? What happened? Did you regret it? Are you more at risk of being an absentee manager or a micromanager? What kinds of situations push you towards one of these modes? Are you currently on a gradual or steep growth trajectory? Were you ever on the opposite one? Have you ever tried to tell a team of people what to do? What were the results? Which step(s) of the Get Stuff Done (GSD) Wheel are easiest or most comfortable for you? What steps do you tend to skip? Where do you get stuck? What are some of the practices your team or organization has today that fall into the different steps of the GSD wheel? Are you a quiet listener or a loud listener? Do you want to foster a culture of debate on a team? If so, how will you do it? If not, why not? How do you help your team make decisions? Are you worried you grab too many decisions? What activities do you do to stay centered? Describe an experience when you weren’t able to bring your best self to work. What happened? How do you build trust with your direct reports/ staff? What strategies or activities have been most effective, and how can you tell? Have you solicited feedback from your direct reports/staff? If so, how have you done it, and has it been successful? Do you have a go-to question for soliciting feedback? What is it? What are some of the ways that you have rewarded criticism? Which of the book’s tips for giving guidance did you find most helpful? 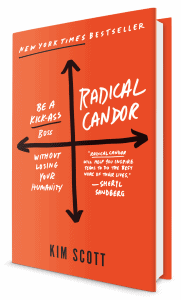 What’s something you could do tomorrow with someone on your team to offer Radical Candor? Do you or can you begin facilitating “Career Conversations” with your direct reports, as a way of caring personally and helping them map out their career trajectories? Do you know the balance of rock stars and superstars on your team? How do you think about growth for different people? Did any of the book’s suggestions for hiring and firing resonate as applicable to your team/company? How do you approach 1:1 meetings? How’s that different than the recommendations laid out in the book? Will you change your 1:1’s? How do you help nurture new ideas? Are there ideas from the book that you’ll adopt? Do you hold staff meetings? How do they compare to the approach in the book? Any recommendations that you’ll incorporate? Do you think the Big Debate or Big Decision meetings described in the book would help your team? What do you think about the number of meetings suggested in this chapter? How do you prevent meeting-creep from taking over the time your team should be spending executing? We hope these questions are helpful in creating a meaningful discussion with your team! Of course, understanding the ideas is just the first step, and changing your habits and day-to-day actions is hard.